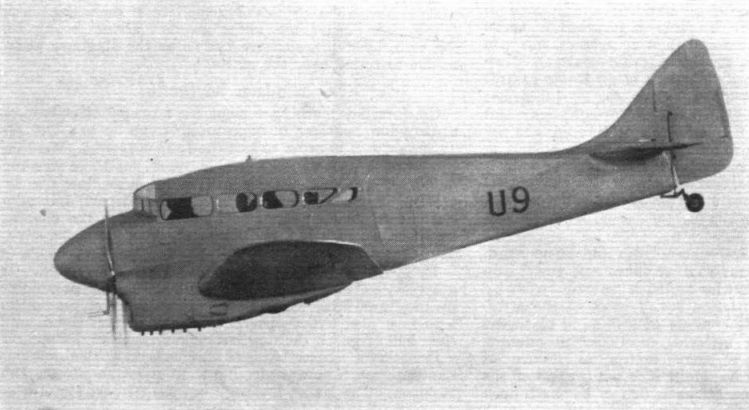 M.8 Peregrine, выполнивший первый полет в 1936 году, стал первым двухмоторным самолетом Ф. Г. Майлза. Силовая установка включала два мотора de Havilland Gipsy Queen мощностью по 205 л. с. Самолет с экипажем из двух человек мог перевозить шесть пассажиров. ДальшеMore>>> Хотя M.8 обладал хорошими летными данными, в серию его не запустили, так как фирма была загружена выпуском Magister. Помимо прототипа был построен еще один Peregrine с моторами Menasco Buccaneer мощностью по 290 л. с. - он использовался как летающая лаборатория британскими ВВС. “BIGGER and better'' seems to be the keynote of the Miles development programme. Since the original Hawk design met with such widespread success there have been produced the Hawk Major, with its training and "de luxe" variations, the Falcon and the Merlin. 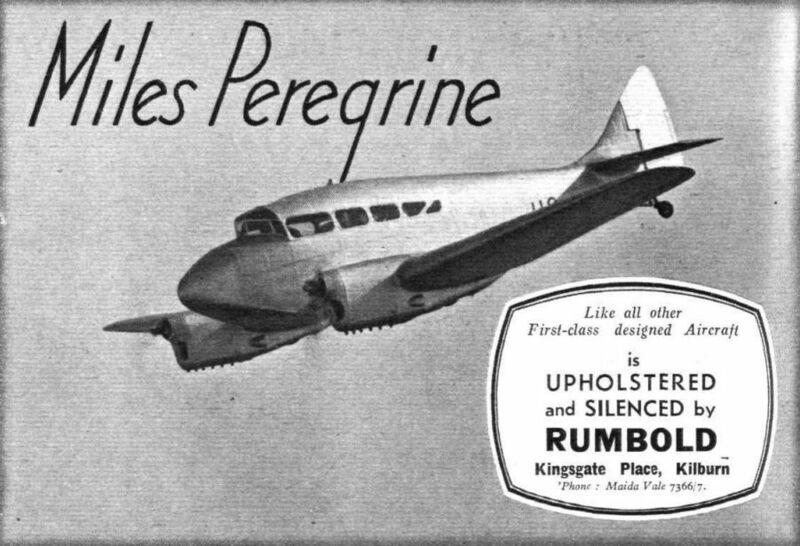 The latest and largest member of the family is the Peregrine twin-engined cabin machine, a low wing monoplane particularly suited to feeder line work, for use as a luxury private owner type, for training in flying multi-engined aircraft, and where a fast economical machine is required for military purposes. As in previous Miles machines wooden construction is employed. The wings are of cantilever type with two spars and plywood covering which takes the drag and torsional stresses. This ply is specially made for its job, and the method of attachment enables a highly polished finish to be obtained thereby enhancing not only appearance, but probably performance also, due to the reduction in skin friction. It is claimed that the method of construction provides a large ''hidden'' safety factor, and that the wing covering can be practically destroyed without failure occurring. The, factors are in excess of Air Ministry requirements. Inspection covers are provided on the main components for routine internal examination. The fuselage is a semi-monocoque structure, and the main cabin is unobstructed by shear members or bulkheads. This cabin is 12ft. long, 4ft. 6in. wide, and is 5ft. high. Up to six seats can be fitted in the rear, and there is a large space aft suitable for camera equipment, wireless, and/or drift and bomb sights. In the nose of the machine, which is sturdy enough to offer protection in the event of nosing over, is a cabin for two pilots. The seats are actually well behind the airscrews, and the undercarriage is placed well forward of the centre of gravity,, making for additional safety. One side of the cabin may be hooded for "blind" instruction. The standard control column consists of a "Y"-shaped member fitted with wheels for aileron control and adjustable fore and aft during flight. "Link" type rudder bars are provided. These give parallel action, and are arranged for easy adjustment over' a range of approximately three inches. Powerful rudder bias gear is included for single engine flight. Fore and aft trim is obtained by adjusting tabs in the elevator operated by an irreversible control, and for varying loads lateral trim is adjusted by another tab inserted in one aileron. Wheel brakes are included as standard, being of the Dunlop pneumatic variety with inter-connected hand and rudder bar control, allowing free movement of the rudder bar in the air and differential control by foot for taxying. The pilots' seats are adjustable fore and aft, for tilt and for height, and all controls, including those for the engines and flap gear, are duplicated. A double instrument panel is included, and two complete sets of flight instruments can be specified. Standard equipment includes flap position indicators on the instrument board, the usual engine instruments, A.S.I.s of both the normal and sensitive type, Reid and Sigrist turn indicator, and fore and aft level. Landing lights of the Harley type are fitted in the wings. These lights are retractable by means of Bowden-wire-type controls operated by the pilot. Navigation lights are included, and for night flying the light intensity on the separate instrument groups is variable. Split flaps of Miles design, electrically operated but provided with alternative hand control, are normally fitted. On the standard Peregrine the undercarriage is of the fixed "trousered" type which has proved so effective on previous Miles designs. The pneumatic compression legs have a specially long travel, and ball bearing wheels are incorporated. A compressed-air container, replenished by an electrically driven and automatically controlled air pump, is provided for the brake system and flaps. Power is supplied by two inverted six-cylinder in line air-cooled engines, either of the D.H. Gipsy Six (200 h.p.) or Napier Javelin (160 h.p.) type. Electric starters operated by push buttons from the pilots' cabin are included as standard equipment. 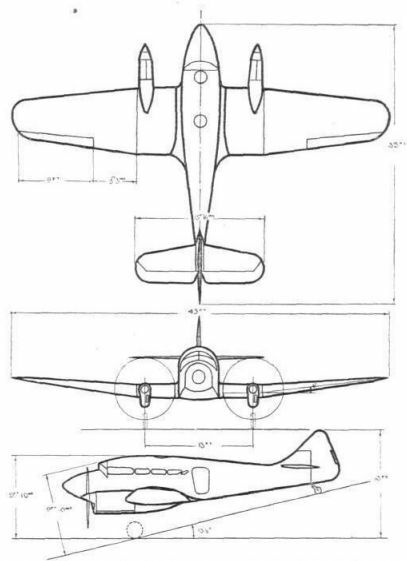 GENERALLY advanced design and the use of the effective Miles split trailing-edge flaps have conferred on the family of single-engined monoplanes produced by Phillips and Powis Aircraft, Ltd., some highly desirable features making for extraordinary performance, pleasant handling characteristics over the wide speed range, and economy of operation. The new Peregrine light transport monoplane has been endowed not only with the more beneficial features of its forebears, but is brought into line with the most modern practice by the inclusion of variable-pitch airscrews and a retractable undercarriage. For the commercial operator its virtues may be summarised as: 2,200 lb. disposal load carried for 562 miles at 160 m.p.h. on about 400 h.p. Although conceived primarily as a civil type for commercial or private employment, the Peregrine is readily adaptable to serve as a twin-engined training machine or, with armament, as a military general-purpose model of no little merit. No attempt has been made to introduce radical departures from standard Miles structural practice. The low cantilever wing has two spars with the Saro plywood covering taking drag and torsional stresses. Mass-balanced, differentially operated Frise ailerons and Miles three-piece split trailing-edge flaps operated by compressed air are specified. The rams for the flaps are accessible through inspection doors in the centre section which, as usual, is parallel in chord and is given no dihedral. The main portion of the fuselage, which embodies the cabin, is of semi-monocoque construction, but aft of the luggage compartment, located immediately behind the cabin, the structure becomes a true monocoque with laminated frames and formers. Production machines will be a foot longer than the prototype, the extra length resulting from a re-designed barrel-shaped nose portion forward of the front spar. A particularly commendable feature is the provision of ample inspection facilities. 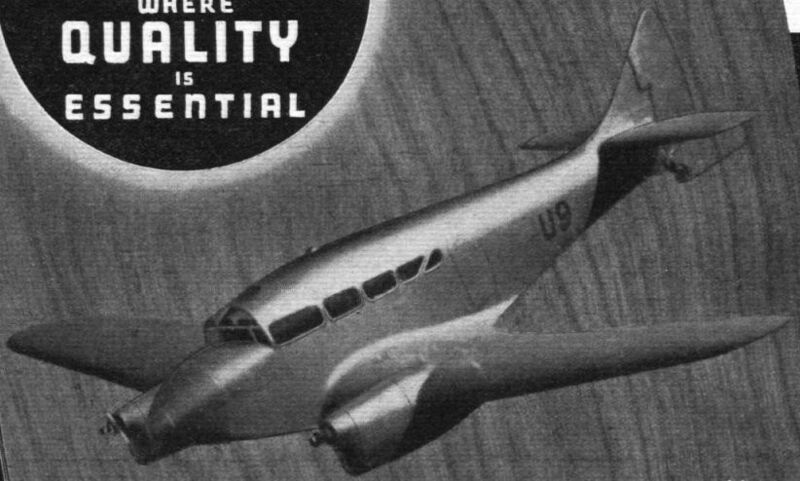 The nose portion of the fuselage hinges on its starboard side and swings aside, revealing the controls, cable conduits and brake operating gear, and there are two downward-folding panels in the floor, followed by a series of small servicing doors in the fuselage bottom for the inspection of all moving parts. The hinges of these folding portions are concealed, leaving a perfectly smooth exterior. Of orthodox layout and construction, the tail unit has a wooden, plywood-covered fin and tail plane and metal rudder and elevator, the latter surfaces incorporating trimming tabs. The undercarriage is in two completely retractable portions, one beneath each engine nacelle. The retracting motion is a rearward and upward one and is effected by compressed air from a Dunlop system, which also supplies the wheel brakes. Lockheed Airdraulic struts are used not only for the main undercarriage, but for the tail wheel. A means of covering the gap admitting the wheels into each nacelle is being developed. The wheels are low-pressure, ball-bearing mounted Dunlops. Power is derived from two of the new De Havilland Series II Gipsy Six six-in-line inverted air-cooled engines, delivering a maximum of 205 h.p. each to De Havilland two-bladed, two-position variable-pitch airscrews of 7ft. 6in diameter. These units are mounted in streamlined nacelles forward of the leading edge of the centre section Their cowlings, incidentally, differ somewhat from those common on Series I engines, having, in place of the large outlet slot formed by the rear of the cowling, two comparatively small outlets and a pair of smaller louvres. Spinners for the airscrew hubs are available. The oil tanks form the tail fairings of the engine nacelles, and fuel is carried, as usual, in wing tanks. Fuel consumption is given as 31 gall./hr., permitting a range of 562 miles. The cabin is entered from the port side and is normally arranged to seat six passengers, the rear seats, nearest the door, being arranged to slide on rails to facilitate entry. The first and second pairs are mounted respectively on front and rear spars. Soundproofing and general upholstery are by Rumbold, and great attention has been paid to the comfort and convenience of passengers. Light luggage racks are fitted above each row of seats, and to each seat there is a lamp, ashtray and container for small articles. Immediately behind the cabin comes the luggage compartment, which is accessible from the cabin through a bulkhead door and from the exterior of the machine through a second door in the fuselage side. 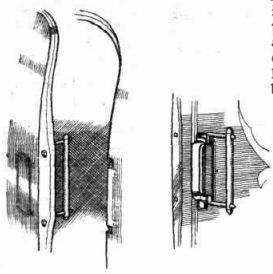 The door-locking arrangements are particularly ingenious, permitting a flush surface on the exterior, as indicated in the sketch on page 597. A pair of Harley retractable landing lights is mounted in the wings, and the equipment includes standard Demec navigation lights and Rotax lights in the cabin and cockpit. 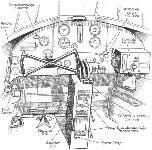 There are a number of usefully original features in the layout of the control cabin of the Miles Peregrine, even though allowance has usually to be made for necessary "jury-rigging" in the case of any prototype. In its present form the Peregrine is not fitted with dual control, but this will be optional on production models, which will also be arranged with a partition between the control cabin and the passengers' compartment. 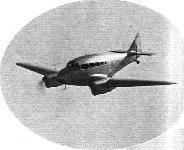 Both flying and auxiliary controls are of the Simmonds-Corsey type. Most interesting of these control features is the way in which the secondary controls are arranged in a bank below the dash and between the two forward seats. 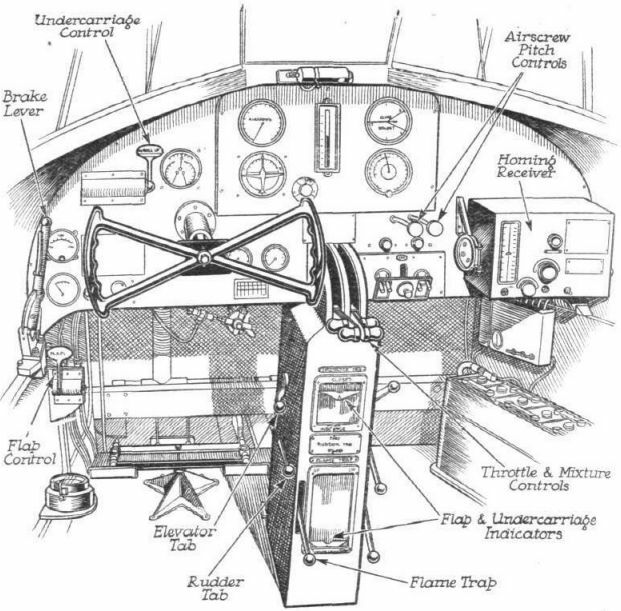 At the base of the dashboard, in the centre, is the throttle and mixture control quadrant, while below, at the side of the centre column, are the elevator tab, rudder tab and controls for the Amal flame traps. On the face of this column are two easily read indicators, one for the flap and the other for the undercarriage position. In addition, a warning buzzer will be installed for the latter. Both the undercarriage and the flaps are pneumatically operated from the same system as that used for the brakes; their respective controls are on the dash at the pilot's left. The airscrew pitch-changing controls are of the push-pull variety on the dash to the right of the central bank. On the right, too, in the case of the prototype, is the latest type of Radio Transmission Equipment receiver and homing set. The present instrument layout includes the normal instruments, of Smith's manufacture, with a Hughes' rate-of-climb indicator, as well as a Reid and Sigrist Gorizon and liquid fore-and-aft level. 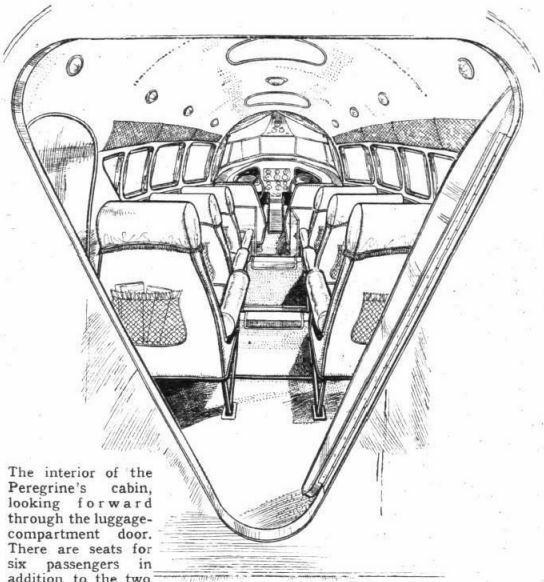 As in the case of the Miles Whitney Straight, the shaped Rhodoid screen is arranged with sliding sections in its main body so that both first and second pilots can obtain an "open-air" view in rain or bad visibility. The apertures are so placed that there is no direct airflow through them, and only a slight draught on either side of the direct line of vision. This draught would be very useful as an indirect means of ventilation in hot weather. The major controls are of the normal type, though the spectacle control has no visible column in the ordinary sense of the term, the horizontal shaft sliding through the dashboard rather after the manner of that in the American Stinson. There is, consequently, no restriction to leg movement. While at Woodley recently we had a chance of flying with the designer in the machine, both lightly and fully loaded. The acceleration provided by the D.H. v.p. airscrews is quite phenomenal, and the Peregrine was off the ground with a full load in something like eight seconds after a two-hundred-yard run. Although the stalling speed in this state is, with the flaps up, probably very little below 60 m.p.h., Mr. Miles climbed her a t this speed, while the rate-of-climb indicator showed something in the region of 1,000 ft./min. At the time, the undercarriage was not retracted, and it is probable that this rate of climb could be considerably improved upon. For the same reason, the indicated maximum and cruising speed were of no interest, though the former was about 160 m.p.h. As a matter of interest to those who are not accustomed to flame-trap controls, these are open at the take-off and closed at cruising r.p.m., or below, in coarse pitch, unless the induction temperature rises above 40 deg. C. In itы present form the elevator tab trimmer will not quite hold the machine on full throttle and fine pitch, but certain minor modifications will be made to the tail unit of production machines. It is possible to fly comfortably, and without loss of height on full load, with either throttle cut back, and the rudder bias will hold the turn in one direction. Some slight rudder pressure is necessary when turning around the running engine. At the stall, flaps down, the machine appears to have no peculiarities and shows no sign of dropping a wing - at least when the stall is made fairly gently, some aileron control remains even after rhythmic shudderings indicate that the airflow is breaking away. With both the flaps and the undercarriage down, the approach is extremely steep, and the former are so efficient that, if the machine is brought in slowly, a little motor is advisable in order to extend the period of hold-off. On neither of the two landings did the machine come to rest much more than 150 yards from the boundary markers. A version with Menasco B.6.S. engines will eventually be available, and will have the following performance (the speed figures in brackets relate to sea-level operation): Maximum speed, 194 m.p.h. (182 m . p . h . ); cruising speed, 172 m.p.h. (162 m.p.h. ); climb to 5,000ft., 4.76 min. ; and climb to 10,000ft., 10.53 min. Two D.H. Gipsy Six Series II (205 h.p. each). Height 9 ft. 10 in. Wing area 300 sq. ft.
Volume of cabin 218 cu. ft.
Volume of luggage compartment 25 cu. ft.
Max. height of cabin 5 ft. 3 in. Length of cabin 12ft. 8in. Max. width of cabin 4 ft. 6in. Wing loading 17.35 lb./sq. ft.
Max. speed (sea level) 180 m.p.h. Cruising speed (sea level) 160 m.p.h. Landing speed (with flaps) 52 m.p.h. Climb to 5,000 ft. 6.07 min. Climb to 10,000 ft. 14.25 min. Climb to 16,000 ft. 2 1/2 min. The tapering line of cabin windows is one of the features which give ths Peregrine such an attractive external appearance. 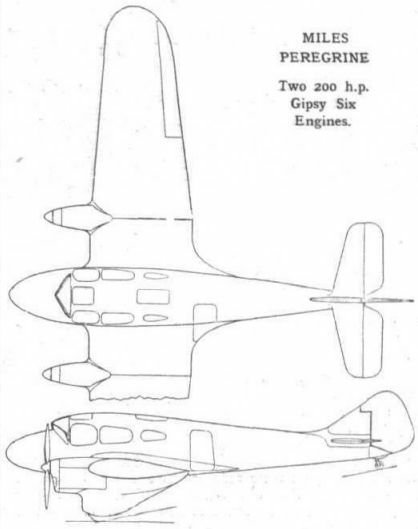 The Miles Peregrine is fitted with two Gipsy Six engines. INHERITED CLEANLINESS. 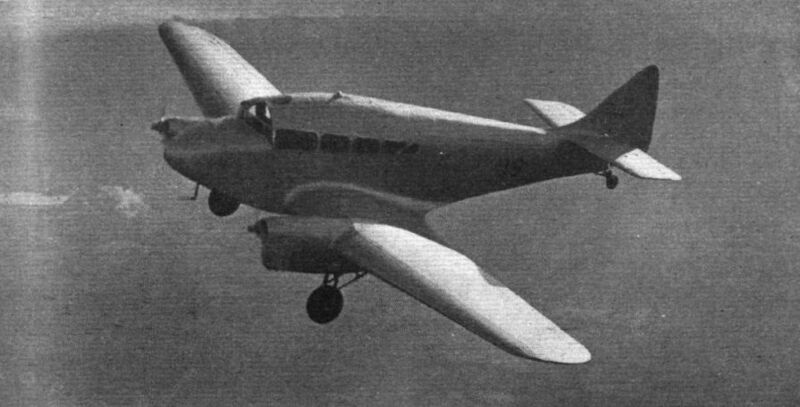 The Miles Peregrine light transport monoplane bears, from many angles, a marked resemblance to the Falcon. With two Gipsy Six IIs the maximum speed with a 2,200 lb. disposable load is 180 m.p.h. Menasco Buccaneer B.6S engines, supercharged to 4,500 ft give an improvement of 14 m.p.h. Один M.8 готовился принять участие в гонках Шлезингера в Йоханнесбурге, но до начала состязаний самолет подготовить не успели, он поднялся в воздух в конце 1937 года. BIGGER BY MILES: The first flying picture of an often discussed but rarely seen addition to the Miles family - the Peregrine. Still characteristically Reading-bred, this light transport monoplane has a maximum speed of 180 m.p.h. A "TWIN" IS BORN. 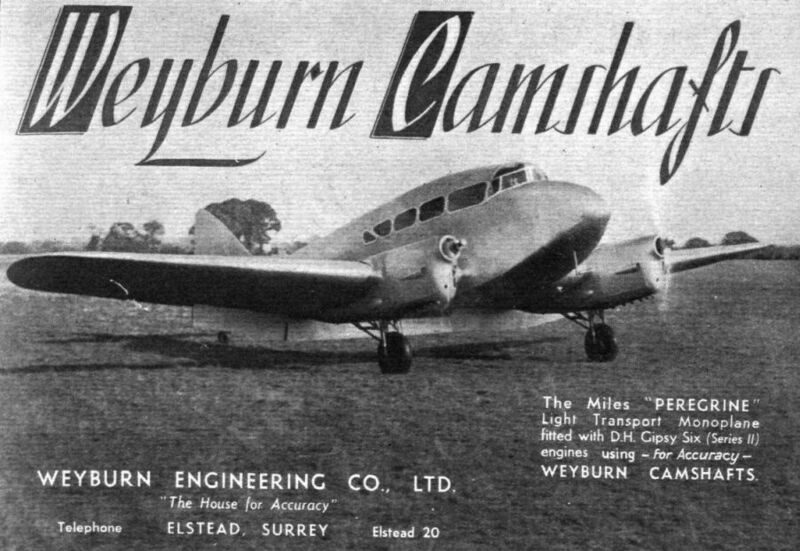 The prototype Miles Peregrine light twin-engined transport with two Series II D.H. Gipsy Sixes and D.H. variable-pitch airscrews. Flaps and a retractable undercarriage are features. This is the machine to be flown in the Schlesinger Race by Fit. Lt. H. R. A. Edwards and Sqd. Ldr. B. S. Thynne. It is apparent from this, the first photograph to be published, that accessibility has not been neglected in the design. 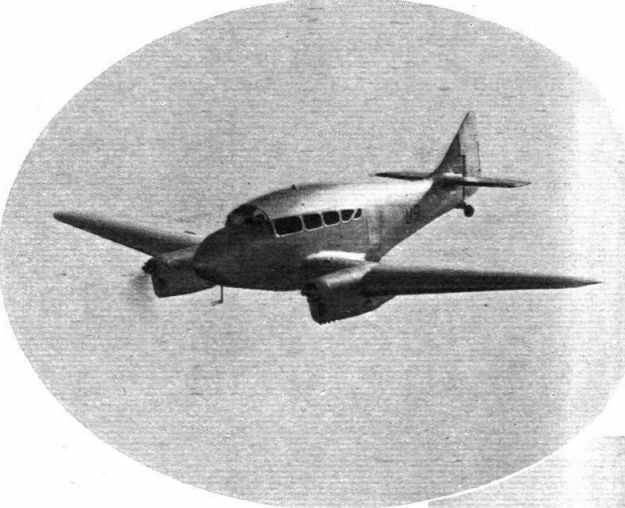 The Miles Peregrine Boundary Layer Survey aircraft. This photograph shows the Peregrine used for these experiments. A commendable feature of the Peregrine's cockpit layout is the central pillar housing the mere important controls and indicators. A flush exterior is preserved on the Peregrine by a special design of concealed door handle illustrated by these sketches. 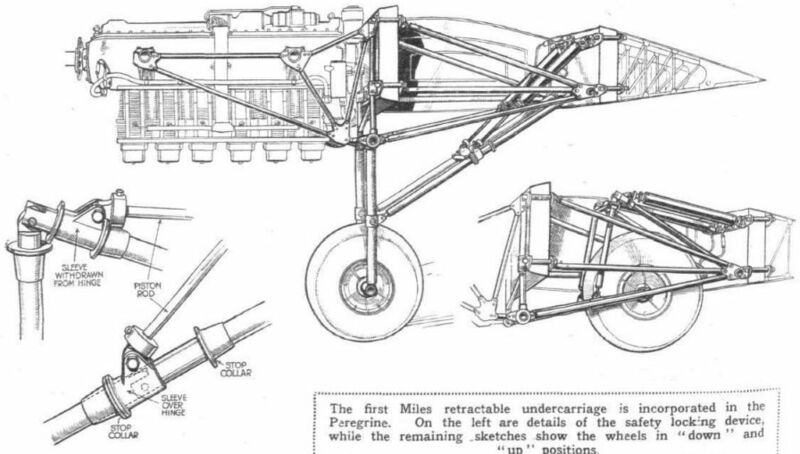 The first Miles retractable undercarriage is incorporated in the Peregrine. On the left are details of the safety locking device, while the remaining sketches show the wheels in "down" and "up" positions. The fine proportions of the Peregrine, despite its roomy cabin, are brought out in these G.A. drawings.